Full Transcript of my interview with Seth Burkett. Hey guys! As promised here is the transcript for my interview with Seth. If you liked the insights in the article then you’re going to love getting your teeth into this. 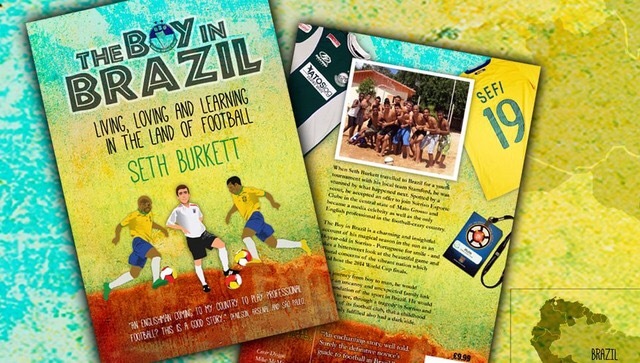 Don’t forget you can get Seth’s book on his experiences in Brazil right here! Jamie Thomas: First Mr Burkett thank you very much for taking the time to speak to me today! Looking at your experiences in English football, obviously you started off at youth level with your hometown club before a couple of other teams showed an interest in you and you ended up as Captain at Stamford’s youth side. It seems you garnered quite a bit of interest from a few youth sides when you were at that stage of your career – was it difficult to deal with that attention, especially since you were so young and evidently focussing on your education? Seth Burkett: It wasn’t really, no. I was playing at county level as well and although I knew there were a couple of sides having a look I remained realistic. I had always understood that I was more likely to succeed through working hard academically, and that any football career would likely be short-lived. It was nice to have that interest but it didn’t distract me. JT: Just quickly on the education front, it seems a bit of a stereotype in British football at least that some players have reached such a level because they’ve spent the time they should’ve been spending in the classroom, on the football pitch. However you’ve been very conscious of the importance of education, whether it be with your A-levels or attending Loughborough – looking back, do you feel you made the right choice in turning down some of the opportunities you were offered in order to prioritise education? If you could go back would you change that? SB: Both of my parents are teachers and I am sure that had a big say on my focus on the academic side. I’m not sure how much I read into that stereotype. At youth level there are many players who are very good academically. The trouble comes when they get a scholarship at a professional club and have to effectively give up on their education. That is the age when being intelligent is often frowned upon. When I played in academies there were a number of players who were bright academically. Upon being released from Northampton Town the head coach admitted that as I was good academically it was probably for the best. Even though a decision on a scholarship was three years away he said that as I was not the best player in the side I would not benefit as it would be unlikely I would get a professional contract. At the time I was gutted but in hindsight I am truly grateful. If you ask any academy coach he will say there are maybe one or two players in each age group who have a chance of making it professionally. The rest are just there to make up the numbers and have no chance when they get to 16. The whole episode with Northampton impacted me greatly, as did the discovery of how much money can be made from semi-professional football. When I was offered a scholarship at the age of 16 I turned it down. I wanted to do A-levels to give me a better chance of getting into Loughborough University. I knew this would enable me to get a better job and also play football on the side to get money. People thought I was crazy but it turned out to be a good decision. Two of the players who got scholarships went on to get professional contracts. After one year of being professional both were released. The next year the club went bust. It is incredibly hard to carve out a career as a professional footballer. I have seen so many exceptional footballers fall by the wayside. As such, I think education is incredibly important. I don’t regret prioritising education at all. JT: When you went to Brazil with Stamford’s youth side for a tournament, was it ever in your mind before you went there that you might get the opportunity that you got or was it not something you really thought about? How quickly did you take the opportunity and how did you family and friends react? SB: I always wanted to do something different and really wanted to play football abroad. I had a real desire to play in a random country, one with football at a low enough standard so that I could be involved with a team who played in the early stages of the Europa League. I had already had trials in both Portugal and Sweden and wanted something permanent. I never thought I’d get anything from Brazil but as soon as the opportunity came up I took it. My friends all thought I was crazy. Those who had been on the tour had seen the standard of living and facilities on offer and were less than impressed. We were only out there for 16 days but the majority got quite homesick. They couldn’t understand why I’d want to struggle in basic, filthy accommodation when I could be happy in my middle-class existence in England. My family were great. They told me to go for it as soon as they heard about it. JT: You hear some of these horror stories every now and then of players like yourself taking a huge step in leaving home to play in another country and one way or another it goes horribly wrong – did those sorts of things ever cross your mind? SB: Having seen the conditions when I first went out to Brazil I knew what I would be faced with. The living conditions were certainly touched. I shared a three-bedroomed converted garage located on the edge of a favela with 31 of my Brazilian teammates. Nobody spoke English. The windows were barred. There was no privacy, the toilets had no doors and the whole place was filthy. It turns out they do this on purpose in Brazil. Even at the best clubs the living conditions are tough. They believe it instils desire in players, a desire to better themselves and escape. In England players are given everything and can enjoy luxury accommodation. This, according to Brazilians, breeds a sense of entitlement. This sense does not work well on the pitch. The player has less desire to train hard and progress. He is happy with his current life. I knew the conditions would be tough, but they turned out to be even harder than I expected. At first it is a massive shock, but you soon adapt to it. After a week I barely even noticed, though I must admit I really missed my warm showers. JT: What was the lifestyle like over there – if a player were in their high-teens over here, even in the lower leagues, they’d probably be getting paid a few hundred, maybe even a thousand, a week and doing rather well for their age. I’m guessing Brazil wasn’t like that? SB: I earned more money playing at Step 4 of the non-league pyramid for Stamford FC. For Stamford I would train for 1.5 hours per week; for Sorriso I would often train for 30 hours per week. That being said, I didn’t really need the money. The club provided the food, accommodation and whatever I wanted. Everything I received financially was profit. It was never about the money for me. Because we had no outgoings we could enjoy our money within reason. Many lads in my team came from poor backgrounds however, and a lot of them sent the majority of their wages home to their families. What money they kept for themselves was spent on partying. The Brazilians love partying. They are always singing, dancing and laughing. It was brilliant to be around. They would always be heading out into the night. It didn’t even matter if we were scheduled to have an early morning training session. They’d still stay out till around 6 or 7am. JT: Overall just how different was the lifestyle over there off the pitch? Is there anything in particular that stood out to you as being particularly strange, diverse or tough to adjust to? SB: Everyone was so much more laid back and positive. Everyone was happy and there would always be somebody singing or playing music. It was infectious and really eased me into my new life. It was eye-opening how seriously religion was taken. We had to pray before every single match and training session. We would all join in a huddle, closing our eyes and pointing our hands toward the sky whilst reciting the Lord’s Prayer. The majority of players would cross themselves each time they entered and left the pitch. Many played with Biblical slogans underneath their kit, and many also took their Bibles and prayer beads to every match for good luck. The heat was the hardest thing to adapt to. Even my teammates from more southerly regions such as Sao Paulo found the heat hard to adapt to. I used to sweat when I ate. It was like living in a sauna. Even something as simple as breathing proved tough at first. JT: Just from looking at the financial information, The FA in England plough far more into the game than their counterparts in Brazil. You’ve experienced the footballing culture in both countries – did that gap in financial backing make itself obvious from the start or is the standard of the facilities etc. similar to what you experienced in football over here? SB: The facilities in England are far superior. The pitches in Brazil either have no grass or far too much grass. They play games on pitches which are incredibly waterlogged. If you learn to pass and dribble on pitches like that then when it comes to playing on immaculate pitches the technique becomes much easier. I believe it is good for development. It makes the game much more natural. JT: There are constant comparisons in the media today about the different playing styles that different leagues have – how would you describe the style of play in Brazil? Do they do anything particularly different in their training to attain this different style of play or is their style just something that is drilled into them? SB: Nothing is drilled into Brazilians and that is the beauty of football over there. The style is so fluid because they receive little instruction: they are given a ball and asked to find a solution to a problem. Right now, this is not the case for the national team, who are rightly described as pragmatic under Scolari. However, if you look at the style of play in the Brazilian leagues you will see this spontaneous, fluid style. This is because most players grow up playing street football and futsal, where players do not have set positions and are expected to play everywhere. Players often only play futsal until the age of around 11, and are only coached on tactics from the age of 13. This compared to England, where a player is often assigned a position which they remain in for their career when they are as young as 7. How can you possibly tell a player where he should play when he is that young? This fluid style is facilitated by a real focus on the beauty of the ball. Joga bonita – play beautiful – is the Brazilian philosophy. Everything is done with the ball over there, even fitness work. Would a musician practise without his instrument? Then why would a footballer practise without a ball? That was our coach at Sorriso’s philosophy. It isn’t rare for over 50% of a training session in England to be conducted without a ball. It is a much more rigid style. In England the coach has far too much say as well. I really feel that we suffer from players being over-coached, with their creativity drained from them as a result. We produce robots. Brazil produces humans who make natural decisions, not something that is drilled into them by an autocratic coach. The game over in Brazil is slower, too. The heat necessitates this. They do not like anything to be rushed, however. They are very disapproving of how the English game relies on everything being done at 100mph. It is a game that relies less on physical aspects and more on the technical aspects. JT: What do you feel to be the most valuable lesson you learned or experience you had while over in Brazil? Is it something you have been or will encouraging other players to do in the future? SB: My most valuable lesson was learned off the pitch. In my house there was a player called Fernando. He came from one of the poorest favelas in Rio de Janeiro. He arrived in our house with all of his belongings for a four-month stay packed into a tiny rucksack. He had a vest, a pair of shorts, two pairs of underpants, a pair of flip-flops and a pair of football boots. Plus a toothbrush. And that was all he owned in the whole world. He sent nearly all of his wages home each month, and yet he was the happiest, most positive person I have ever met. If Fernando can be so happy when coming from such a desperate situation then why can I not be happy? Fernando always told me to always be happy no matter what, and I believe this is incredibly important. Fernando taught me how things don’t matter, it’s all about how you approach life. I strongly encourage other players to go abroad to play football. You learn so much both on and off the pitch. I think this is why England suffer as well. We only have players who play in the English leagues. We are ignorant to other cultures and styles of football. You look at the Spanish and German teams, they have players playing everywhere. I look at a player like Jack Wilshere and can see how much he would improve if he went abroad to play. JT: Is going back to Brazil something you’ve considered, either to play or coach or anything else? What is the next career step for you now – does it involve football or are you going to be taking advantage of the educational background you’ve managed to build up over the years? SB: I would love to return to Brazil to play. The only trouble is that going back to Brazil requires me to speak with Brazilians. I am yet to meet an organised, time-conscious Brazilian. I’ve been offered so many contracts since returning and it has always broken down once the team has attempted to sort my contract. Even when I offer to play for free they can’t manage it. I plan to take advantage of my educational background but would love to have another few seasons in Brazil first. JT: I wanted to ask what were your thoughts about Greg Dyke’s (now defunct) plans for an extra league for B Teams and the work that has been done to try and bring more British players through the ranks? Do you think enough is being done to try and bring youngsters through? SB: Not nearly enough, no. I love non-league football over here (the concept, not the style of play) and so am opposed to B teams. At the moment there aren’t really any benefits to bringing through English talent. It may even be a hindrance to the big clubs. You sign a superstar from Japan to play at left back and you suddenly get a big following from Japan. You get increased shirt sales, sponsorship opportunities and everything. You bring a young English player through to play at left back and a few of his mates will come along and it is good PR. And then if you do want a good English player they cost way above what they should. More incentives need to be given to play English players. The concept of ‘home-grown’ players needs looking at. English players should be encouraged to play abroad in their formative years. JT: Do you think any of the FA’s ideas have been the right way forward, whether those ideas are the ones that have been passed up or the ones that have been put through? SB: The focus on coach education is a positive, though care needs to be taken to ensure that players are not over-coached. The new focus on futsal – particularly youth futsal is also a massive step in the right direction, as long as children are encouraged to express themselves and enjoy the experience. JT: After your experience in a country where they’re consistently producing at least a few players a generation that are, or are among, the best in the world in their positions – what lessons do you think we can learn from these other countries who just seem to be getting it right internationally? I.e if you had to go to the FA tomorrow with a few points about what you’d seen over there and how we could learn from it over here in Britain then what would you say? SB: The most important aspect is without doubt the dangers of over-coaching. Players should be encouraged to express themselves on the pitch and to play without fear. I’d recommend that players are not put in positions that they specialise in until they are 13 years old. I’d stress the benefits of futsal and street football when played at an early age. If players are allowed to express themselves and enjoy the experience without worrying about making a mistake then creativity should be fostered. We don’t want to create robots. We want to create skilful, spontaneous players, players who joga bonita. My first post for The Offside Rule Podcast (We Get It)! A very proud moment for me this – check out a copy of my first article for the Offside Rule Podcast! You can find the article itself here on the Offside Rule Podcast’s website but this blog has had 1000 views in the last month so I thought at the very least I should put a copy of my most important article to date on here! The article is based on an interview I had with a young man called Seth Burkett. Seth is the first English footballer to have ever played professionally for a Brazilian domestic side and, whilst I spoke to him about a number of different topics which you can see in the full transcript here, the article is based on where he thinks the British can learn from what he saw over there in Brazil! “Would a musician practise without his instrument? Then why would a footballer practise without a ball at his feet? “Brazil’s fluid style is facilitated by a real focus on the beauty of the ball; they always train with the ball at their feet. Joga Bonita – play beautiful – is the Brazilian philosophy,” he added. A key concept that kept popping up in our interview was Burkett’s belief that our youngsters are being over-coached, arguing that players need to be given freedom from an early age to express themselves. He said: “If young players are allowed to express themselves and enjoy the experience without worrying about making a mistake then creativity should be fostered as a result. Follow Seth on Twitter here! My Final Repost for the Moment! My take on what England need to do to become a top side again! In case you haven’t heard, Germany won their fourth FIFA World Cup tournament last night. Much has been made about how the collective trumped the individual, as most of the billing pre-game was centred around the German unit and how they would cope with one of the game’s best ever players Lionel Messi. They coped (as the result suggests) more than adequately with that threat but German football, after a little blip in terms of winning tournaments at least, last night accomplished what Franz Beckenbauer and others had imagined they’d do way back when they started putting the building blocks for this success in place back in 1999. It seems hard to believe nowadays that the Germans haven’t always been this efficient, dominant, tactically brilliant unit that they are today but if you go back to the 1990s, the Germans had some real problems. They still won tournaments in the 90s; winning the 1990 World Cup and Euro 96 but towards the end of the decade they started developing some of the problems we’ve began to see in English football over the last few years. The Germans saw the amount of non-German players in their league rise exponentially from less than 20% in the early 90s to nearly 50% by the end of the decade, thanks to the television rights money and other financial windfalls coming clubs’ ways that allowed them to spend money on expensive foreign talent. Sound familiar? The German FA revealed an extensive plan to fix this issue and bring back the production line that had made their international and domestic sides so competitive over the years – they were up there with Brazil after 1990 with three World Cup trophies each, and domestically German clubs had won 11 continental tournaments between them by the end of the 20th century. But still, the Germans could see the problems arising and as such, developed an expansive plan to fix the issues. You may remember when St George’s Park opened back in 2012, nine years after its initial projected opening, that it was hailed as something to rival France’s Clairefontaine and Spain’s RFEF national training centre; facilities which had been at the centre of France and Spain’s respective international successes over the past 10-15 years. Beckenbauer (the German FA vice-president at the time), Dietrich Weise (the head of youth development in the German FA) and co. had a similar idea back in 1999, only they were forward thinking enough to realise that nothing should stop their project from going ahead. They believed that producing the talent that was good enough to challenge on the international stage was far more important than building a national stadium, which is one of the reasons why England’s national training complex’s development was postponed. In essence, the German plan was twofold: they planned to build over 100 national talent centres across the country to help players in their early years get the kind of tactical and technical training that would serve them well in their professional careers; they also made it essential for each club in the top divisions of the country to build a football academy. Another benefit to them was that German citizenship laws were changing. The new laws were much more modern and allowed the likes of Mesut Ozil, Sami Khedira and some of the other non-German born players we see lighting up the national side today to become part of the German youth set-up. Everything just seemed to fall into place to allow this plan to work. But still, patience was needed – none of this “we’ll win this tournament in this many years and we’ll win that tournament in that many years” – the situation actually seemed to get a bit worse before it got better as the foreign presence in the Bundesliga became even more saturated as by 2003 more than half of the players in the German top flight were foreign. The vast amounts of television rights money coming Germany’s way though soon stopped as the conglomerate that was backing them all went bust, putting most clubs into serious financial trouble. The solution was a perhaps painful but necessary one as clubs were forced to sell or cut loose some of their more average, but still expensive, foreign talent and replace them with the academy starlets that they’d been developing since the reforms proposed in ’99. I remember my beloved Manchester United losing to Stuttgart in the Champions League with a bunch of home-grown players in the 03-04 season – I didn’t envy it at all because we’d made our success over the last dozen years with the Class of 92’ but looking back on it now having learnt what I have about the German youth system it just shows that what they were doing over there was working. It was taking time, but it was working. If the Germans are anything, as there style of play suggests, they’re patient and that patience paid off in the long-run as what has been the result of all that restructuring over the years reached its pinnacle last night. They might not have been the most convincing on the night, but they won the World Cup and it doesn’t get much better than that if you’re an international team; retaining it will be the next challenge and thanks to the hard work and planning that the German FA have put in over the last 15 years, it is very much achievable. The English can learn a lot from this. They’ve had their initiatives and ideas over the years but it all seems to be a bit panicky and a bit all over the place. The Germans had a clear idea and they stuck to it – it took a long time but they got their rewards. The FA have been trying to copy the blueprints of European powerhouses for a couple of years now – we haven’t seen the results of it yet, but I’m confident we will. Unlike some of the high-profile names that have recently said we don’t need to copy these teams, I believe we absolutely do. Originality of style is neither here or there as that will come to show itself in time but football has become more of a results business than ever over the last 20 years or so and if copying these other teams is the quickest way to get results then so be it. The problem, as I’ve said already, is sticking to a solid plan. It sounds simple enough but when you have the FA on one page and the Premier League seemingly on another. You’ve seen over the last few years with all this faffing around over a winter break and whether we should or shouldn’t have one in this country that it’s not a simple fix. It should be though; if we want success to return to international football in the British Isles we need a clear, concise plan that all parties are willing to stick to and abide to from the lower rungs of the game all the way to the top. Will we then be able to challenge the World elite on the international stage? I believe so. With a bit of patience and perseverance, stealing the traits of our cousins on the continent, the British could well reach the pinnacle again one day.